Virginia-based Crafthouse secured more than $250 million dollars of funding to expand the brand nationwide. In addition to in-line or end cap locations, this development agreement with American Development Partners provides qualified franchisees with 100% financing to develop freestanding buildings for Crafthouse restaurants. American Development Partners' primary role will be to aid in the development of new locations, facilitate the acquisition of land and oversee construction of over 100 new Crafthouse franchise locations within the next five years. Matz opened three Crafthouse restaurants in Northern Virginia (Fairfax, Arlington and Reston) in May 2017 and has built a loyal and enthusiastic following. Keys to success for the restaurants include creating a welcoming atmosphere with a hands-on operating team and a commitment to using local ingredients and vendors as much as possible. Franchise candidates should have at least $300,000 in liquid assets and a net worth over $1 million. fresh&co launched its franchise opportunity and plans to further expand throughout the Northeast. With 18 corporate-owned restaurants currently open and operating throughout New York City (17 in Manhattan and one in Brooklyn), the expansion plans will tackle underserved neighborhoods in Manhattan, the boroughs, and the outskirts of Long Island and New Jersey. According to co-founder and CEO George Tenedios, the growth will be primarily achieved through multi-unit franchising, as well as the opening three to five new corporate stores each year. A franchise development agreement for three restaurants in the Westchester area of New York has already been signed. 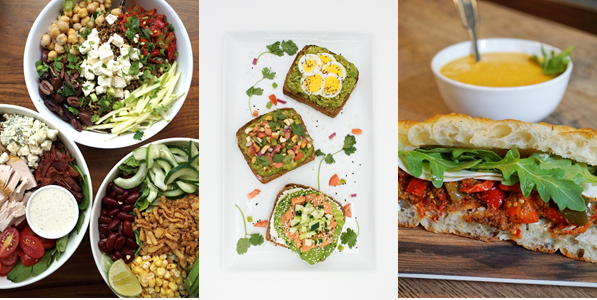 fresh&co’s chef-inspired menu uses seasonal, local and organic ingredients from carefully chosen suppliers and growers to create flavorful meals that accommodate an array of dietary choices and needs. In addition to partnering with local suppliers, fresh&co acquired its own farm in Orient, New York where they supply fruits and vegetables directly to their NYC restaurants to provide the ultimate from-farm-to-desk® experience. fresh&co only uses vegetarian-fed, hormone-free poultry and meats, along with non-GMO, natural, ands wherever possible, organic ingredients. The restaurants serve three meals a day, and snacks and juices too, for round-the-clock visits. Including a franchise fee of $45,000, the estimated initial investment to open a fresh&co franchise is between $633,000 and $1,503,500 in New.York City. Each location typically occupies approximately 1,200-2,000 square feet of retail space and presents franchisees with multiple revenue streams (breakfast, lunch, dinner and catering). Captain D’s signed two franchise development agreements that will expand its footprint in key target markets throughout the Southeast, as well as mark the brand’s entry into the South Florida market. This surge in franchise development is a reflection of the brand’s aggressive growth strategy and is fueled by the ongoing success Captain D’s has experienced over the past several years, company officials said. As part of this development, Captain D’s entry in South Florida will be spearheaded by new franchisee Josh Royal, president of Harborside Holdings Corporation. Royal has signed an agreement to open three new locations throughout the region, specifically targeting Belle Glade, Riviera Beach and Lehigh Acres, with the first location slated to open in late 2019. Royal and his family have extensive experience in the restaurant industry, and in addition to their agreement with Captain D’s, they currently operate 10 Popeye’s locations throughout the South Florida market and have previously owned Burger King franchises. Captain D’s also signed a franchise development agreement with NFL retiree Donnell Thompson, who will bring a new location to Fayetteville, North Carolina in late 2019. After a 10-year career playing defensive end for the Indianapolis Colts, Thompson retired from the NFL and began his career in the restaurant industry. He brings more than 20 years experience in the quick service and fast casual segment, and currently owns and operates several Denny’s restaurants throughout North Carolina, South Carolina and Georgia. 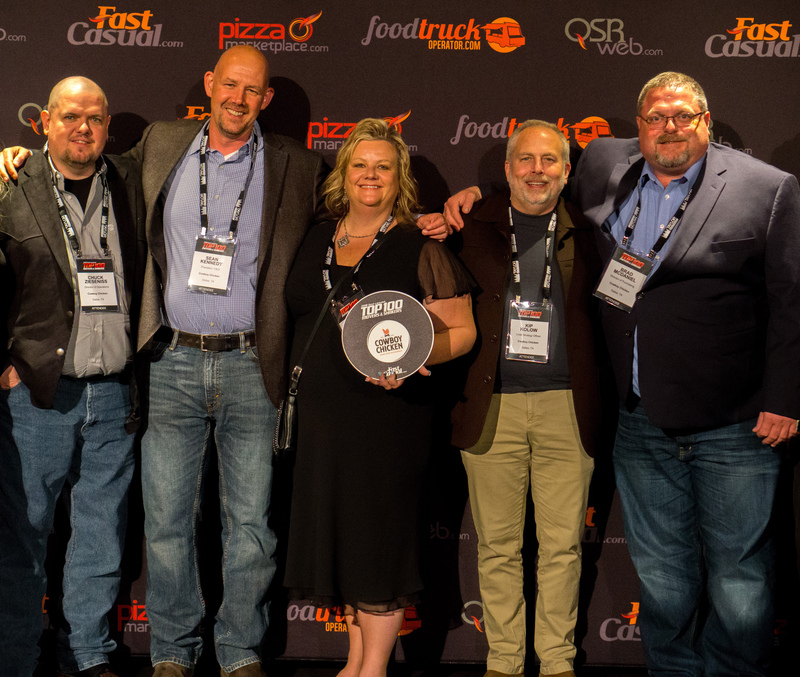 MOD Super Fast Pizza Holdings, is celebrating the opening of its 400th location – MOD Spring Prairie, located in Kalispell, Montana – on Friday, Nov. 23, coinciding with MOD’s 10th birthday. The company also built on its commitment to tackle childhood hunger in the U.S. through its annual “Spreading MODness” Week. “This is a special week for MOD – we are celebrating the opening of our 400thlocation and our 10th birthday. Sharing this celebration with the week of Thanksgiving is so fitting for MOD, as giving thanks and embracing the power of gratitude is one of our core beliefs. What we are most grateful for are the over 8,000 passionate, hard-working MOD Squaders system-wide*, spread across 28 states and the UK. Together, we have built an industry-leading business that has been a force for good in the lives of our people and in the communities we serve. As we reflect on our first 10 years, we are more motivated than ever by the potential of MOD,” explains Scott Svenson, MOD’s co-founder and CEO. Through its collaboration with Generosity Feeds, a non-profit committed to ending childhood hunger, MOD provides funding for meal packing events across the country. The meals of beans and rice are nutritious, filling and compact enough to go home from school in a child’s backpack. To date, MOD’s partnership has provided over half a million meals in communities across the US. It is expected that next week’s Spreading MODness efforts will help create a million meals in 2019. Golden Corral brougt on restaurant industry veteran Van Ingram as Vice President of Franchise Development. In this role, he will oversee the franchise development process for new franchisees entering the system and he will coordinate with the current development team to support the growth of existing franchisees. Dallas-based Cowboy Chicken is poised for growth through franchising and corporate expansion. Kip Kolow, co-founder of Boston Market, is now working as Chief Strategy Officer of the wood-fired rotisserie restaurant chain, joining forces with president and CEO Sean Kennedy to strengthen systems and put processes in place to expand the fast casual brand across the country. What began in 1981 as a single restaurant in Dallas has now grown into over 25 company-owned and franchised restaurants located throughout Texas and in Louisiana, Georgia, Oklahoma, Iowa, South Dakota and California. Fajita Pete’s signed several franchise agreements to open 10 new restaurants throughout Texas. The Houston-based restaurant chain has executed a four-location development agreement, a three-location development agreement, and three single-location agreements. Noble Restaurant Group currently has a location open in Pearland with four additional locations in development. The franchisee’s next location is set to open at 2600 Travis St. in Houston in January 2019. Ft. Bend Fajitas, LLC expanded their agreement to open three additional locations, with the first new location opening in Katy this week. Franchisees Mike and Amanda Green operate a location at 8552 Highway 6 N. in Houston and will open an additional location in Cypress. Franchisees Jeremy Dixon and Jacob Yezak will open College Station’s first Fajita Pete’s restaurant early next year and Jerrell Nelson will open Spring’s first location in 2019. The brand currently has 10 locations across Texas with six additional locations set to open by the end of the first quarter of 2019. Franchise agreements, which include assistance with everything from site selection to operations and sales, are available throughout Texas and for other markets. 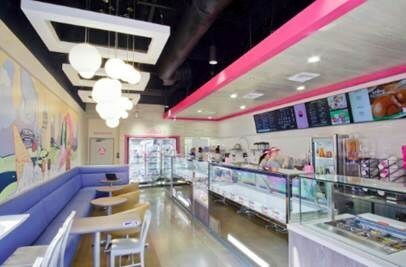 Baskin-Robbins unveiled its "Moments" concept store design, top photo, which will give guests an entirely new and engaging experience when they visit Baskin-Robbins. The new store concept debuted in Fresno, California and will initiate a national rollout beginning in 2019. "Many people today live busy, always-on lives which means that a chance to unplug, spend a few minutes with your friend, partner or child, reconnecting over a scoop or two of your favorite ice cream flavor really matters to people," said Carol Austin, Vice President of Marketing. "That's why we are so excited about the new 'Moments' store design – it's intended to be an inviting place for guests to come enjoy the best ice cream on Earth and create that pure and simple moment." Dunkin’ opened its newest location at Great Wolf Lodge Pocono Mountains, Pennsylvania, making it the twelfth restaurant to open under a franchise agreement between Dunkin’ and Great Wolf Resorts, Inc., North America’s largest family of indoor water park resorts. Great Wolf Resorts, Inc. owns and operates all twelve of these locations, which serve Dunkin’s menu of delicious food and beverages to resort guests. These items include a range of hot and iced coffee and espresso beverages; hot and iced teas; a variety of donuts, muffins and croissants; and oven-toasted breakfast sandwiches available any time of day. Dunkin’ has existing restaurants at Great Wolf Lodge Resorts in Colorado Springs, Concord, N.C; Williamsburg, Va.; Traverse City, Mich.; Sandusky, Ohio; Fitchburg, Mass. ; Mason, Ohio, Garden Grove, Calif.; LaGrange, Ga.; Bloomington, Minn. and Gurnee, Ill. with additional locations planned to open in 2019, including Scottsdale, Ariz. Opportunities exist to grow with Dunkin’ in the hotel sector. Flexible design options are available to suit any lodging facility, including full retail restaurants, kiosks and self-serve hot coffee stations perfect for gift shops and general stores. Dunkin’ locations can also be designed to suit specific areas such as snack bars and convention registration areas. Dunkin' bakery products can be prepared in the property's own kitchen, with the addition of some simple equipment, giving the food and beverage team flexibility to manage product inventory in accordance with guest traffic. O’Charley’s Restaurant and Bar, with more than 200 locations across 17 states, has partnered with Olo to make online ordering even easier for customers. Olo's on-demand interface for the restaurant industry powers digital ordering and delivery for more than 250 restaurant brands across 50,000 locations. Olo’s enterprise-grade software powers every stage of the digital restaurant transaction––from fully-branded guest interfaces to the back-of-house order management features that help keep the kitchen running smoothly. Olo integrates into (POS) systems at O’Charley’s, enabling accurate order preparation and completion while eliminating wait times. Twin Peaks Restaurants said Front Burner veteran, Alex Sadowsky, has joined the team as Executive Chef. Sadowsky graduated from the Culinary Institute of America in 2009 with a bachelor’s degree in Culinary Arts and Hospitality Management. Afterward, he moved back to his home state of Minnesota to master his craft in some of St. Paul’s most esteemed kitchens. In 2015, Sadowsky left Minnesota and moved to Dallas, where he was the Chef De Cuisine at Whiskey Cake in Plano. He helped Whiskey Cake develop its menu and thoroughly enjoyed being in a kitchen that takes such great efforts to be locally sourced, innovative and seasonal. Sadowsky transitioned to the position of Interim Regional Chef, where he supported openings for multiple new Front Burner Restaurant brands. His primary focus was driving the culinary success of each menu and helping grow the brands. El Pollo Loco, Inc. appointed industry veteran Hector A. Muñoz as Chief Marketing Officer, effective December 3. Muñoz brings more than 25 years of QSR experience and successful marketing leadership for some of the industry’s leading global brands. Munoz’s appointment comes on the heels of the addition of Jennifer Jaffe, El Pollo Loco’s first Chief People Officer, further strengthening the El Pollo Loco senior leadership team. He was most recently Executive Vice President and Global Chief Marketing Officer at Church’s Chicken, where as a member of the Executive team, he led all global marketing efforts for both the Church’s Chicken and Texas Chicken brands, with leadership responsibilities for brand strategy and sales development. Under his leadership, Church’s Chicken recorded five consecutive quarters of positive global same store sales, the best performance of its kind in more than 10 years. Prior to Church’s, he spent six years as the U.S. Chief Marketing Officer for Popeyes Louisiana Kitchen, Inc., where he played a key role in achieving 24 consecutive quarters of positive same store sales. Mr. Muñoz also served as Vice President of Global Brand Image and New Concept Strategy for Burger King Corporation, where he held multiple positions over a 12 year period, and held marketing and advertising leadership roles for Long John Silver’s, Bruegger’s Bagels and Bozell Worldwide. In his role as Chief Marketing Officer, Muñoz will be responsible for overseeing all Marketing and Brand Strategy functions, including menu and new product development, advertising and PR, digital and social media and consumer engagement for El Pollo Loco’s more than 480 company-owned and franchised restaurants. Nearly 35 years after launching its iconic BOOK IT! program, Pizza Hut is expanding its commitment to literacy through its partnership with the National Football League by joining forces with Pizza Hut NFL player ambassadors and team partners to shine a spotlight on the importance of reading to kids and parents across the nation. "In our first year as the Official Pizza Sponsor of the NFL, we have a powerful opportunity to work with the League, its teams and players to do even more to support childhood literacy – a cause Pizza Hut has championed for more than three decades," said Marianne Radley, chief brand officer, Pizza Hut, U.S. "The support of these NFL players really exemplifies their commitment to success on and off the field for kids across the country, and we're privileged to work with athletes like Todd Gurley. His passion for literacy will not only inspire young readers but will also help drive awareness for this critical social issue we're hoping to improve." This year, Todd will champion literacy for the NFL's My Cause My Cleats initiative by wearing custom-designed Nike cleats dedicated to reading during the LA Rams home game on Dec. 16. 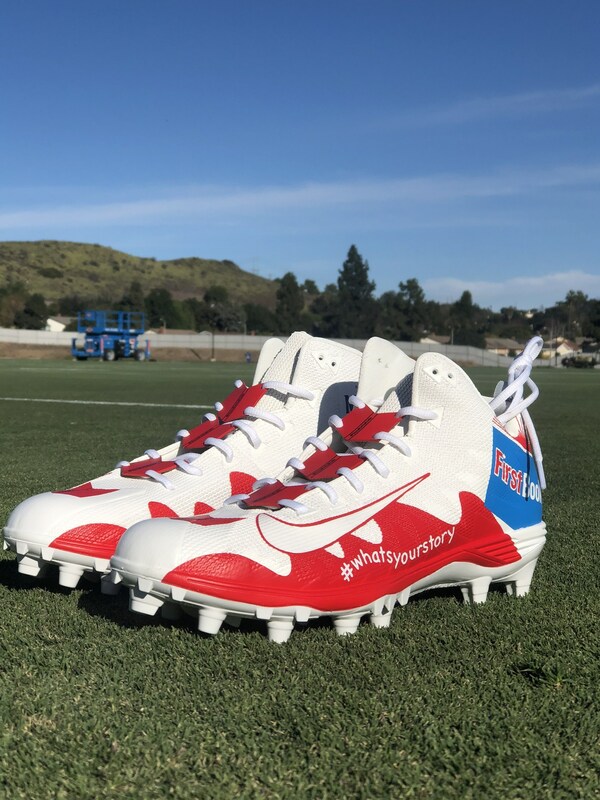 The cleats feature Todd's children's book of choice, "The Magician's Hat" written by fellow NFL player Malcolm Mitchell, and Pizza Hut partner First Book, a nonprofit dedicated to creating equal access to quality education for children in need. "Growing up, I was taught that reading and writing were the foundation for my education," said Todd Gurley, running back for the Los Angeles Rams. "Knowing the importance of literacy programs for kids across the country, I'm teaming up with First Book and my fellow Georgia alumni and Super Bowl champion Malcolm Mitchell, author of 'The Magicians Hat', for My Cause My Cleats." "My Cause My Cleats is a great way to showcase the philanthropic passions of NFL players," said NFL SVP of Social Responsibility Anna Isaacson. "We are proud to highlight the hundreds of players who make a tremendous impact on our communities every day." To learn more about childhood literacy initiatives at Pizza Hut and how the brand is working with the NFL, click here. Anthony's Coal Fired Pizza opened its third Chicagoland location. The restaurant, located in Kildeer Village Square at 20413 North Rand Road, will offer a coal fired-focused menu. Nearly everything — including pizzas, chicken wings, meatballs, pork ribs, and more — will be cooked in a blazing-hot, coal-fired oven. In the dining room, 86 seats surround what is affectionately known as the “Pizza Theater.” This showcase area features the restaurant’s coal-fired oven as well as the men and women who carefully craft each pizza and manage the temperament of the fire. A full U-shaped bar serving craft beer, a carefully selected wine list featuring varietals from California and Italy, and craft cocktails — such as the Sicilian Shandy, Aperol Spritz, Coal Fired Cosmo, and the Mediterranean Mule — will be located between the dining room and the toasty warm indoor/outdoor patio, and has seating for an additional 32 guests. 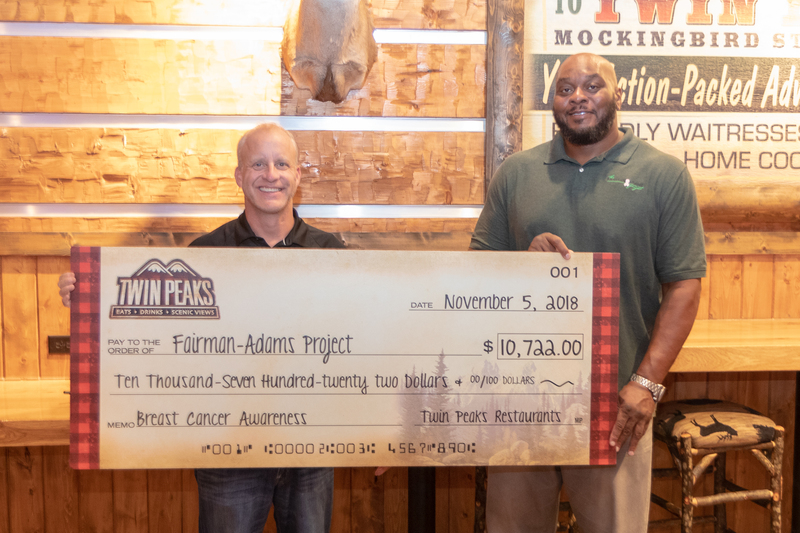 On Monday, Nov. 5, Twin Peaks Restaurants presented a check for $10,722 to The Fairman-Adams Project Founder Flozell Adams. Earlier this year, Twin Peaks pledged to donate $2 from every dessert sold on Fridays in October to breast cancer education and awareness. The Fairman-Adams Project was founded by former Dallas Cowboy and Pittsburgh Steeler Flozell Adams in memory of his late mother, Rachel Fairman. Adams lost his mother to breast cancer and upon retiring from the NFL, he has dedicated his time to fight the disease that has claimed the lives of so many. The nonprofit organization believes the fight against breast cancer starts with increasing awareness through education, providing diagnostic breast care services for patients diagnosed with the disease and supporting those in treatment. Twin Peaks currently has 84 locations in 26 states. Panda Express' philanthropic arm, Panda Cares Foundation, announced the second annual Project Fortunate campaign, developed to thank guests and associates for supporting the restaurant's charitable efforts over the years. As Panda Express celebrates its 35th anniversary and embarks on the season of giving, Project Fortunate will serve as a reminder of the smiles given back to underserved children and families through Panda Express' in-store donation program, which has raised more than $95 million in charitable contributions since the restaurant was established in 1983. "Project Fortunate is an opportunity for us to highlight the remarkable generosity our guests and associates display every time they contribute to Panda Cares," said Peggy Cherng, Co-Chair and Co-CEO of Panda Restaurant Group. "Through the ringing of our bell in-stores, we are able to illustrate how thankful we are for the chance to help those in need and to bring hope to the communities that we operate in." As a gentle reminder to guests that their kindness has a large impact, once a donation has been made, associates ring the bell and express acknowledgement by giving guests a loud and genuine "Thank you." The in-store bells are a symbol of the celebratory bell children ring when they're able to go home from a stay at a Children's Miracle Network hospital, one of Panda Cares' primary charitable partners. As a result of in-store donations and the Associate Giving Program, Panda Cares raised more than $32 million in 2017. "During this important time of giving, we feel extremely fortunate for our guests and members of the Panda family who are able to uplift their communities," said Dr. Cherng. "As an organization, our hope is to create an environment that nurtures the spirit of selflessness through our core values which are grounded in gratitude and generosity." In addition to the Children's Miracle Network partnership, the millions donated each year by guests and associates give Panda Cares the ability to provide funding to Panda's Education Programs benefitting over 780,000 students, and enabled the donation of 110,159 meals in 2017. With over 35,000 associates and 2,100 restaurants globally, Panda Express truly believes every individual has the power to make a difference. 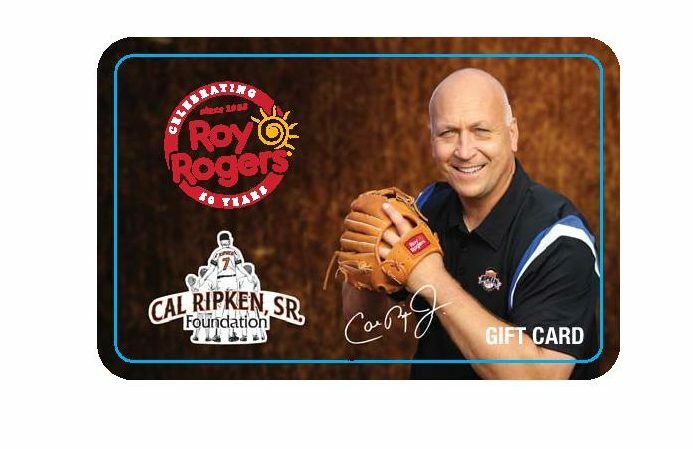 Roy Rogers issued a new branded gift card featuring Cal Ripken, Jr.. Available at participating locations through December 31, 2018, the gift cards are good for purchases at participating Roy Rogers restaurants. Roy Rogers will donate 10 percent of all gift card proceeds to the Cal Ripken, Sr. Foundation, a nonprofit whose mission is to help build character and teach critical life lessons to at-risk young people living in America’s most distressed communities by providing programs, opportunities and educational skills for underprivileged youth. In addition, guests will receive a free $5 gift card for every $25 worth of gift cards purchased. Roy Rogers has been celebrating its 50th anniversary throughout 2018 with a campaign featuring Cal Ripken, Jr. as a spokesperson for the chain, including incorporating him into advertising and collateral materials, hosting guest appearances by the famous Baltimore baseball player at individual Roy Rogers locations in Maryland and surrounding states, scheduling appearances for Cal on television and radio programs and more. The western-themed chain originated in 1968 and quickly became popular across multiple dayparts and generations. Today, there are 53 locations spread throughout Maryland, Virginia, West Virginia, New Jersey, New York and Pennsylvania. The company is famous for serving up a “Triple Threat” – three popular main dishes including USDA choice top round roast beef, hand-breaded, fresh fried chicken and great-tasting burgers. Roy Rogers is also known for its famous Fixin’s Bar®, where guests can customize their orders with a variety of fresh produce, condiments and signature sauces. 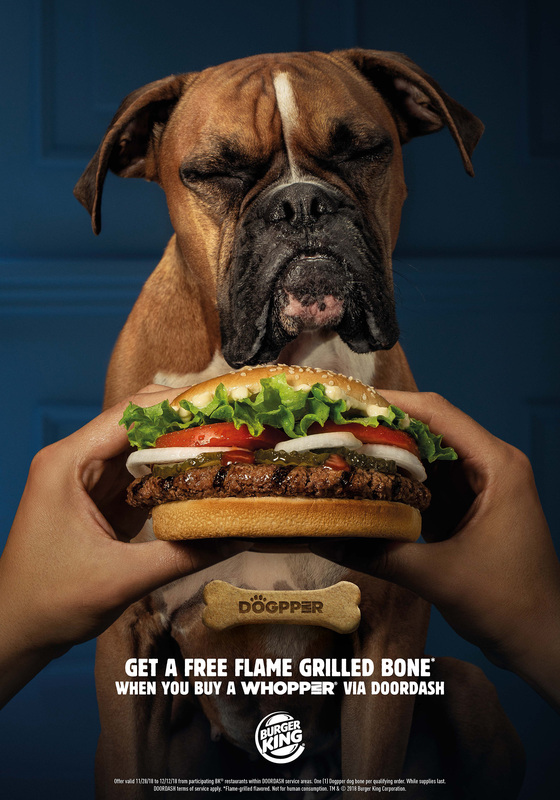 In an LTO partnership wtih DoorDash, the BURGER KING® brand knows that dog owners often deal with their furry friend begging for food when they order delivery. Many dog owners have even admitted to sharing part of their meal with them. That’s why BURGER KING® is providing a solution for customers who want to enjoy their order at home without interruption from their pets.